Spending • What Would You Do? 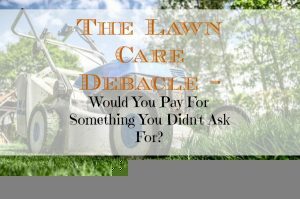 The Lawn Care Debacle – Would You Pay For Something You Didn’t Ask For? I noticed my neighbor’s truck parked on the road near my house when I came home from the gym. He is a groundskeeper for his day job, but provides commercial lawn services as a side job. Pulling into the driveway I could see the hose running from the tank mounted on his truck through my lawn and into my backyard. He was applying weed killer on my yard. The problem was, I hadn’t hired him. I normally take care of my own yard, but I had hired him for some applications over the last few years when the weeds got a little out of hand. Last fall I had discussed with him the possibility of using him exclusively this year, but when I got the usual mailing from him this Spring I didn’t send back the contract to reserve my spot for any applications. I walked around my house for what I thought was going to be an awkward conversation, as we’re also friends. After a brief discussion, there appeared to have been a misunderstanding. He had been at my home the weekend before for a Memorial Day party and thought I had told him that I wanted to have my yard sprayed. I had made no such request, as I had applied fertilizer and weed killer myself less than a week before. I offered to pay him for his services. I knew that I had no obligation to pay him, but I didn’t want this situation to affect our friendship. 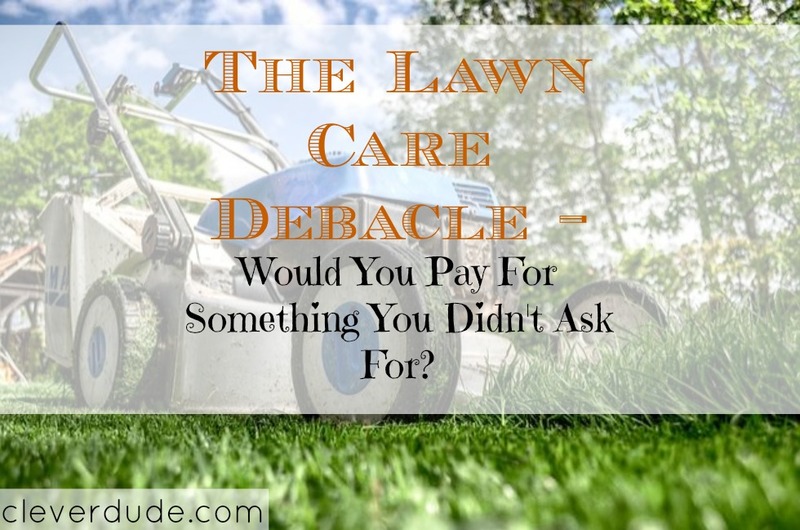 It felt weird pointing out his mistake and not paying for something that I knew my lawn would certainly benefit from. After a few rounds of me telling him to write up an invoice, and him declining, I knew that we had reached a stalemate. We chatted for a few more minutes, and I invited him to a BBQ we are planning next weekend to celebrate the end of the school year, and the beginning of Summer. â€œIf you’re not going to write me out an invoice, the least you can do is let me feed you well next weekend,â€ I said. â€œSounds good!â€ was his reply. That’s how we left things. What do you think, will this affect our friendship? What would you have done? I think you handled it very well. No harm no foul but thats only because he was already a friend. I dont think I would have handled a stranger the same way. Sounds like the best way possible to handle it! @Thomas – Since it was a friend, I’m sure he was just trying to do me a favor by getting it done (thinking he had my permission). Had it been just a random company, I would hope they wouldn’t have done it without a signed contract. If they had, I would have just assumed they were trying to drum up business through questionable methods. 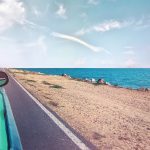 @Jenny – Thank you so much – I hope it works out…only time will tell though! @KC – I hope so….and if he had said no to the BBQ then I WOULD be worried – haha! You must have handled it well, because you got the best possible outcome. You looked generous by offering to pay him even though it was his mistake. He realized it was his mistake and saw that you wanted to be nice about it, but decided not to take advantage of your generosity. If he had accepted payment for it, you probably would have been resentful about paying for something you didn’t want, so it’s nice that he values your friendship enough to avoid that. @Sara – I’m glad you brought that up (how I would have felt had he accepted my payment). I’m not sure how I would have reacted and I think you’re right. I would have at some level resented the fact that I had to shell out for an unexpected expense that I purposely avoided by applying weed killer myself. I’m also glad that you emphasized that he most likely declined payment not only as a business decision, but also because he values our friendship. It really gave me a new perspective on the situation and makes me feel better about the outcome. That is a tough situation. I am not the diplomat so I guess I would have let the guy take his loss, although being a neighbor and a friend, maybe not. My boyfriend is regularly buying stuff from neighbors, the last thing that annoyed me is bread because I bake a better one and this one would go bad while he eats my bread. But he says we are buying into the community and to be fair it is not a big expense, just annoying that whatever quantity of bread our worker brings over, he would buy it. @pauline – I really tried to pay him….but he wouldn’t let me. But I’ll make sure I make it up to him this weekend thought at our BBQ. 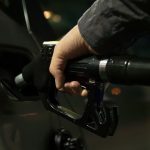 “Buying into the community” is an interesting perspective – I guess that may help if you just moved into a new neighborhood and trying to build bonds with the people you live near. Thanks for stopping by!